69% of enterprises who have separate budgets for cloud computing are predicting spending increases this year and into 2014. This is one of several key take-aways from a research study published today by TheInfoPro, a service of 451 Research. TheInfoPro Wave 5 Cloud Computing Study is based on research completed in the first six months of 2013, and relies on live interviews with IT management and primary decision-makers in midsize and large enterprises in Europe and North America. You can view details of TheInfoPro Cloud Computing Overview Program and methodology here. The worldwide cloud computing market will grow at a 36% compound annual growth rate (CAGR) through 2016, reaching a market size of $19.5B by 2016. 38% of enterprises surveyed break out cloud computing budgets, while 60% include cloud-related spending as part of their enterprise-wide IT budgets. TheInfoPro asserts that cloud computing’s benefits of greater business orchestration and reduced time-to-market have led to a change in budgeting approaches. The median enterprise cloud computing budget is $675,000 and the mean enterprise cloud computing budget is $8,234,438. 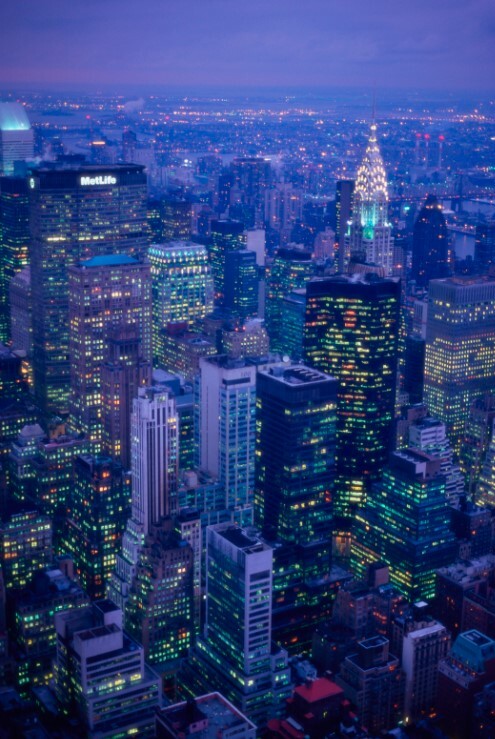 The study found the largest enterprise cloud computing budget at $125M. 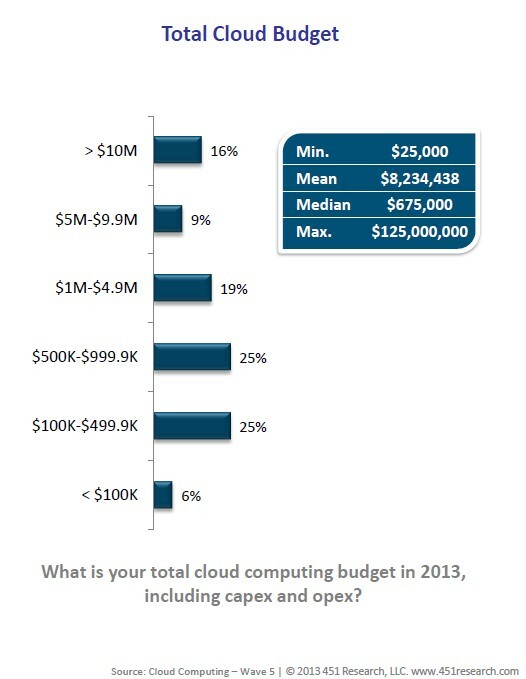 The following graphic provides a distribution of cloud computing budgets by range. 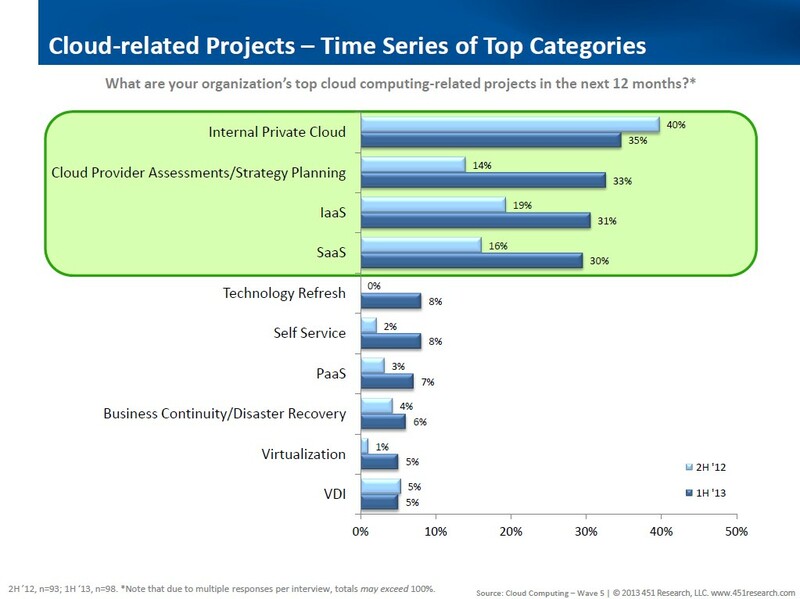 Internal Private Cloud (35%), Cloud Provider Assessments/Strategy Planning (33%), Infrastructure-as-a-Service (IaaS) (31%) and Software-as-a-Service (30%) are the top four cloud computing-related projects enterprises are working on right now. Cloud Provider Assessments/Strategy Planning have seen the largest increase, attributable to more enterprises looking to better support strategic plans with more agile, efficient IT organizations. 83% of enterprises face significant roadblocks that hold them back from moving beyond cost reduction to faster time-to-market and better orchestration of their businesses. Respondents mentioned that politics, budget, time and staff are the main sources of roadblocks to getting more value out of their cloud computing investments. The majority of these roadblocks are not related to IT. They include lack of clarity regarding organization and budget (37%), resistance to change (16%) and lack of trust (visibility and reliability) (15%). 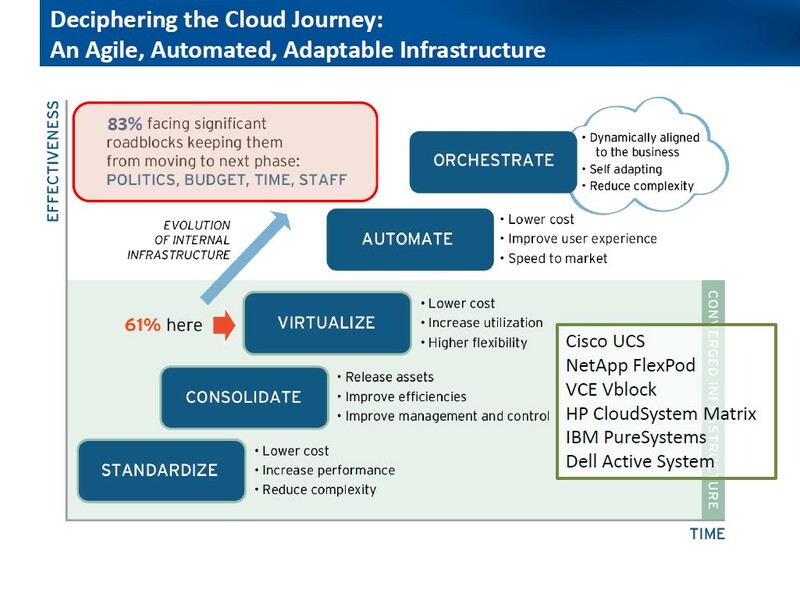 The following graphic illustrates the enterprise cloud journey as defined in TheInfoPro Wave 5 Cloud Computing Study. Consistent with many other enterprise cloud computing surveys, security is the biggest pain point and roadblock to cloud computing adoption (30%). Migration and integration of legacy and on-premise systems with cloud applications (18%) is second, and lack of internal process (18%) is third. 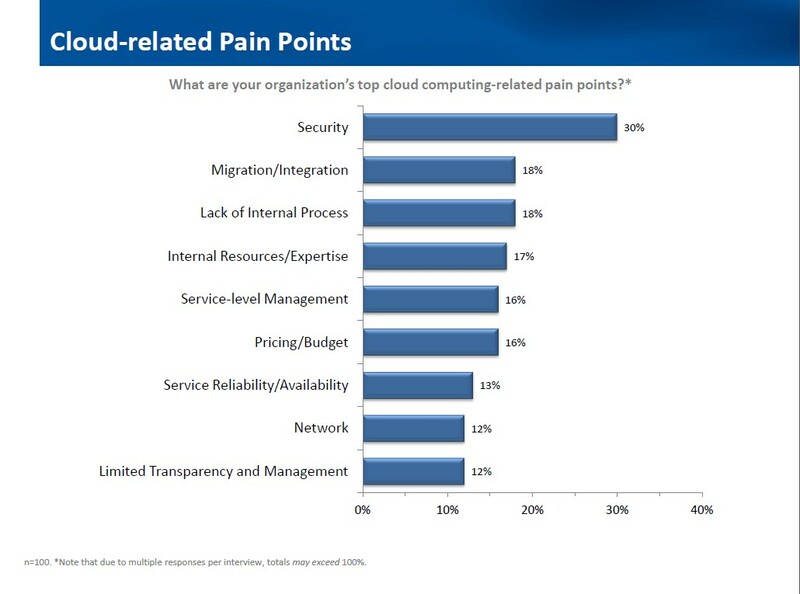 The following graphic shows a rank ordering of cloud computing-related pain points.